It’s (almost) universally acknowledged that puppies are absolutely adorable. Dogs have many different stages of development throughout their younger years, and each stage brings its own experiences. For example, a fledgling puppy will not know how to walk on a lead. When you bring it out for a walk, it sits down and looks at you like you have two heads. It doesn’t know what it’s supposed to do when you loop this odd contraption around its neck. Unfortunately for you, dogs are not born with an instinctive knowledge about humanity’s domestication habits! Another comical phase of development is when they hit the point where they want to explore but are too small to get up onto the couch or go up the stairs. Those little whimpers would break even the coldest heart when they keep trying to pull themselves up. There aren’t many things in life that are more adorable than a fluffy puppy doing their mini cry at the top of the stairs. While you want them to learn and progress, most puppy parents will give in and carry them down. Moments like these are what dog owning is all about. Unfortunately, these adorable stages are inevitably accompanied by less desirable incidences, like when your puppy has been destroying the furniture or doing its business around the home when you aren’t home. As with all things in life, the highs would seem quite so high without the lows! Auburn Leach is the man for the task with regards to standard puppy training. Leach and his staff offer a range of training services including in-home training, doggie boot camps, training and rehabilitation, and also a boot camp especially for puppies! Can you imagine how fun it would be to watch all the clumsy puppies running around barking and falling over one another before Leach and his team work wonders? The style of the training is praise-based, which is wonderful. Here at Pawpals we are strongly against training based on fear or punishment. Such training results in dogs who are frightened easily and jumpy. Praise-based rewards a dog for good behavior, and firmly corrects them using an authoritative voice and relevant gestures for bad behavior. If you got a puppy from a shelter and are already noticing problem behaviors, there’s no need to panic. Leach specializes in problem behaviors including aggression, anxiety, submissive and excited urination, chewing, and separation anxiety. It’s always reassuring to know that the professional you’re hiring has more than pretty words to offer. Leach graduated from the Connecticut branch of the United States K9 academy in 1996 and has more than thirty years of dog training experience. He does not shy away from aggressive dogs, and will work with an aggressive dog even other trainers won’t go near. Puppies are rarely aggressive, but if you got a breed that is associated with aggression and require the extra peace of mind, you can consult Leach to see how to prevent such behaviors from ever materializing. If you eventually want your puppy to become a therapy dog, you can benefit from the services of Off Leash K9 Training. These professional trainers certainly know what they’re doing, as just recently they got top marks with Therapy Dog International. Eight out of eight of the dogs they trained received their certification. After considering this fact, it comes as no surprise that they advertise themselves as celebrity trainers. If it’s good enough for a celebrity, it’s good enough for you! There are a few things you should know before you jump into therapy dog training for your puppy or adult dog. It’s a lovely idea to think that your dog could help brighten up a stranger’s day, but not all dogs are suitable to be a therapy dog. Every dog is unique, and they have a wide range of temperaments. A dog who is possessive over his or her bone is not suitable to be around kids who may try to take it off them, for example. The best type of dog for therapy is a dog who loves all people: young and old, male and female; quiet and overbearing. If you have a puppy that seems shy or withdrawn around strangers, therapy dog training isn’t for you. Similarly, if you have a loud puppy who barks when anyone rings the doorbell or delivers the mail, it might not be wise to put them forward to be a therapy dog in a quiet old people’s home! 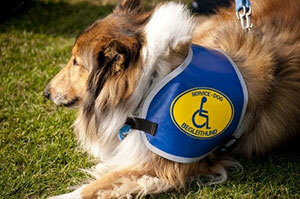 Service Dogs Virginia is a non-profit organization that operates out of Charlottesville. They raise and train dogs with the specific purpose of placing them with disabled people when they are ready. Service dogs allow people with disabilities to live a more content and independent lifestyle. The organization offers a variety of programs including physical assistance dogs, autism service dogs, and diabetic alert dogs. Under certain circumstances, they will accept dogs who have been raised as puppies by their original owners. However, this is at the discretion of the Executive Director. You probably don’t want to give your puppy away, but if you’re getting too old or sickly to look after it, this could be an excellent opportunity for both you and your puppy. When you move somewhere new, you want to feel like a part of the community. Even if you live in the Northern Virginia area, you may live in a place that doesn’t allow animals. You’ve always wanted to own a dog, but your landlord is adamant about his or her ‘no pets allowed policy’. Well, you don’t have to worry. All you have to do is move to one of the best pet-friendly places to live in Northern Virginia, and all that’s left is a trip to the shelter to see which dog you want to adopt and bring home! It’s all fair and good to highlight the top places for puppy training in Northern Virginia, but not everything can be left to the trainer. It is important for you, the owner, to build on what the trainer does and not to contradict the lessons the puppy has learned. Your puppy might be very receptive to the professional training it gets, but if you are too lazy or busy to ensure it doesn’t fall back into bad habits no amount of training on earth will solve the problem. It’s up to you to find out how to discipline a dog and make sure you teach it right from wrong in your household. If you live in a house with numerous people (family, housemates, students) it is important that you fill them in on your training style so they don’t undermine that you’re trying to teach your puppy or dog.